I was home in Wisconsin over this last weekend and spent a lot of time flipping through old photo albums. 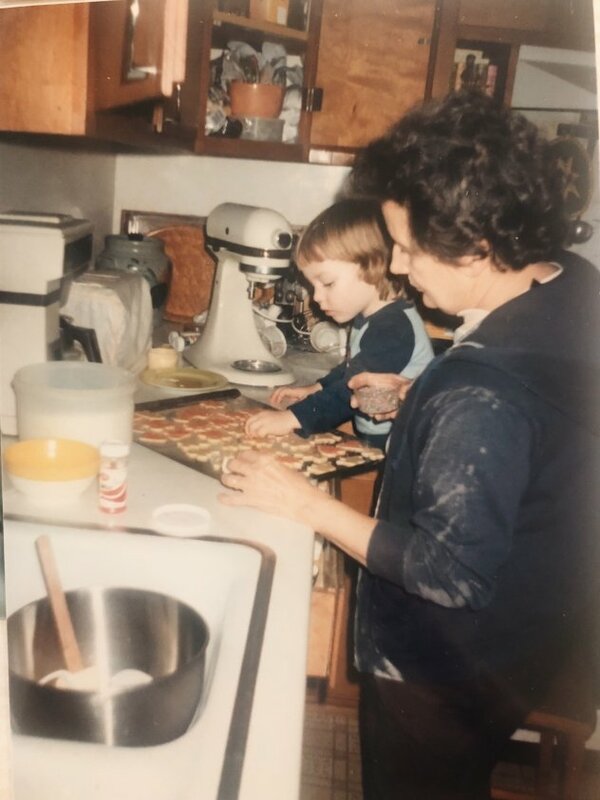 My family was really good about documenting the little moments of the day that make up a life – pulling weeds in the garden with grandma, sorting and counting acorns with grandpa, making silly faces with my aunt and uncle, and of course – standing on my little step stool next to my grandma to help her bake and cook. It’s where my love of living in the kitchen all began. Seeing the pictures really brought those memories back to life. It’s so amazing how photos have the power to help us remember exactly how we felt in a moment. The way the spoon felt in your hand, how it felt to look up to someone, feeling so safe and loved. It’s good to be reminded of those small but significant things every once and awhile, especially when “adulting” and the every day can demand so much of us. It’s also good to be reminded of how much food and love have in common. And Thanksgiving is the perfect opportunity to show off just how much the same they can be. 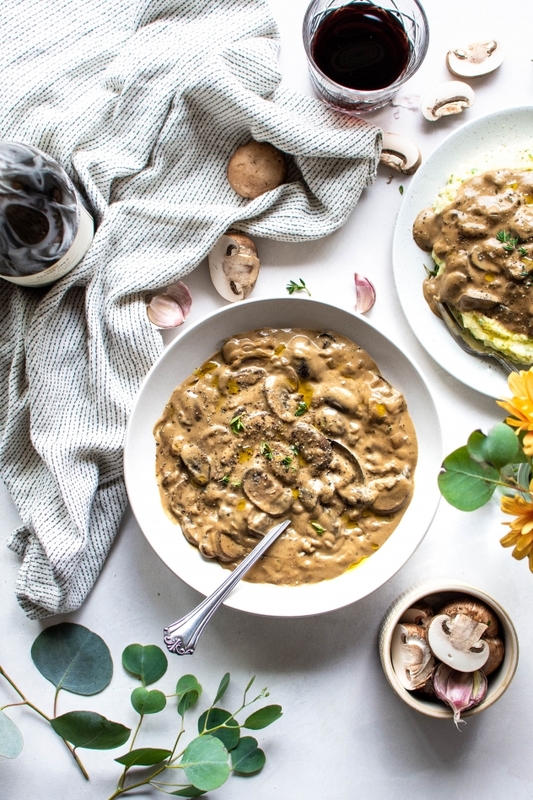 And why not start with a delicious and healthy mushroom gravy? After all, I’m pretty sure that gravy makes just about everything taste better. If she were still around, I’m pretty sure my grandma would say yep, you got that right, kiddo. 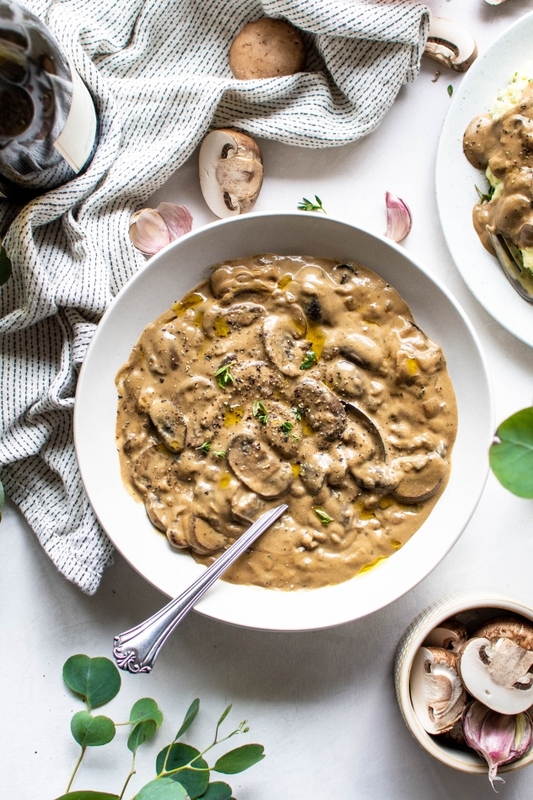 This mushroom gravy is pretty simple to make. It’s really all about developing some complex flavors by sautéing mushrooms, onions, and herbs together until deeply caramelized. After that you add your broth of choice and let it simmer away until it’s reduced slightly and the flavors have gotten nice and friendly. 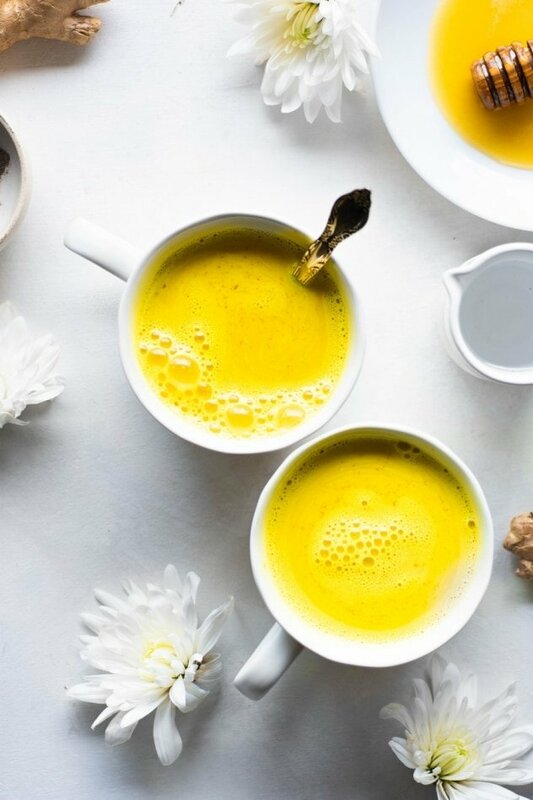 Use the best tasting broth you can find – it will make a big difference in the overall flavor of the gravy. Homemade broth is great, but there’s also lots of tasty store bought options out there, too. 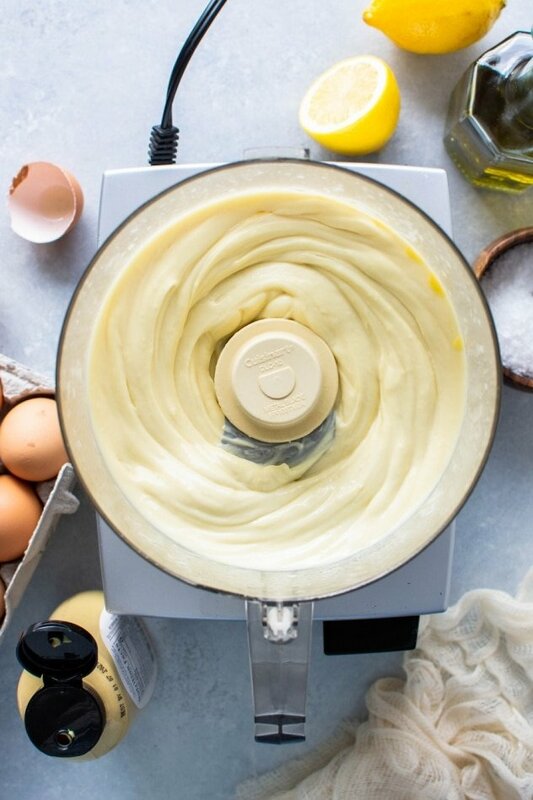 The rich creaminess of the gravy comes from… cashew cream! 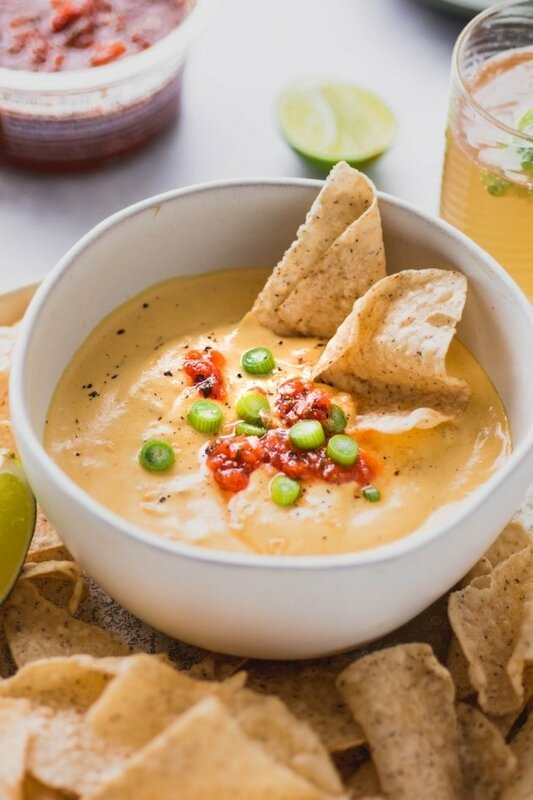 My all time favorite dairy free alternative for creamy sauces, soups, and dips. 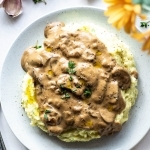 The neutral flavor and silky texture make it a great fit for lots of recipes, and gravy is a perfect example of how it can shine. The best part is that unlike a traditional gravy made with flour, this one reheats BEAUTIFULLY. So it’s super make ahead friendly, which can be a big help during Thanksgiving / holiday meal prep. It might thicken up a little bit when you store it in the fridge, but it should return to the same consistency once it’s been gently warmed on the stove top. If it still seems too thick after warming, you can always whisk in a little extra broth until it’s just right. 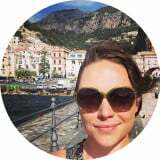 is this gluten free and vegan mushroom gravy healthy? Yes! 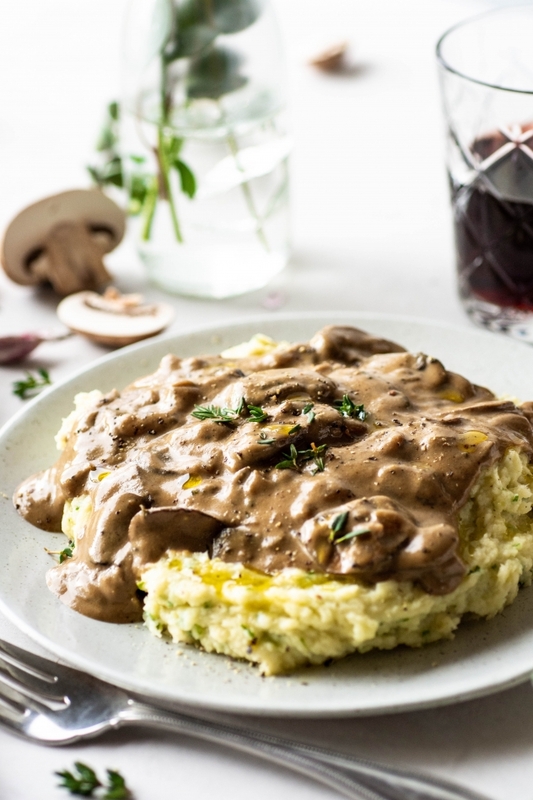 This mushroom gravy recipe is very healthy. It’s made with whole food ingredients like mushrooms, onions, garlic, nourishing broth, herbs, spices, and thickened with cashew cream. Which means leaving out the stuff that can irritate our digestion and immune systems like dairy, wheat, and thickening starches. Because delicious food should make you feel GOOD. 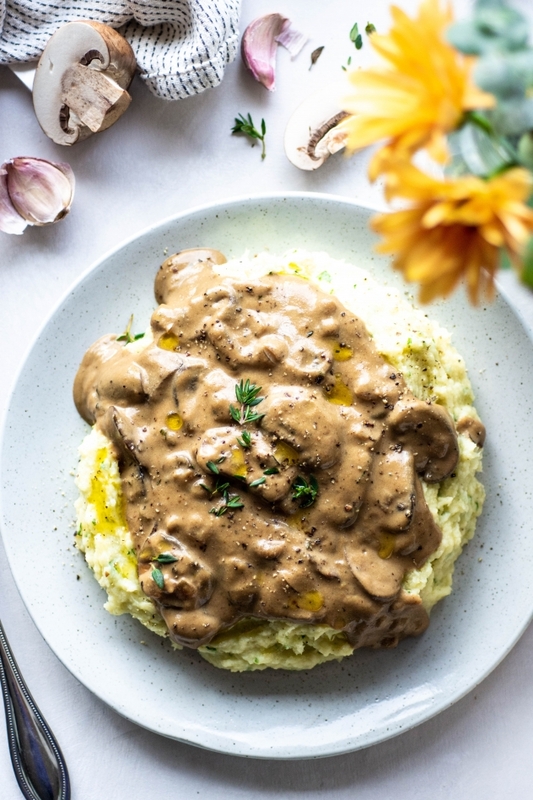 Besides making a show-stopping appearance on your Thanksgiving table, this gluten free and vegan mushroom gravy would be a good fit for so many tasty meals. 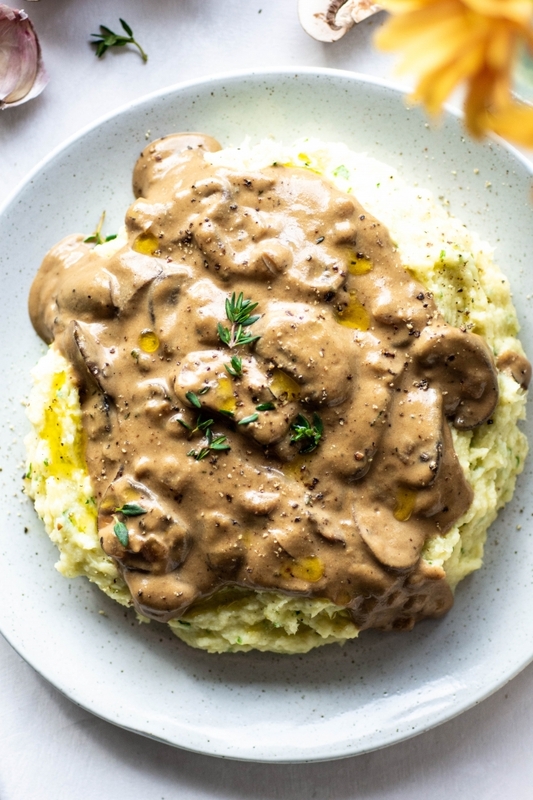 And on and on and on… The gluten free and vegan mushroom gravy laden meals could literally go on forever. Add raw cashews to a heat proof bowl and add enough boiling water to cover by about an inch. Set a timer for 30 minutes and set aside. Heat avocado oil over medium high heat in a large, wide skillet until it’s shimmering. Cast iron works best for getting a nice sear on the mushrooms, but any big skillet will work. Add sliced mushrooms to the pan and allow to cook undisturbed for about a minute. Toss to coat and continue to let cook for about a minute or so at a time before stirring. This will allow a nice golden color to form on the mushrooms. Cook until all the moisture from the mushrooms has evaporated and they are brown and glistening. This should take about 10-15 minutes, but some mushrooms may release more liquid than others. If it seems like there’s a lot of liquid in the pan, just be patient and wait for the liquid to evaporate and for the mushrooms to start to brown. Turn the heat down to medium and add the diced onions and the extra tablespoon of avocado oil. Continue to cook, stirring occasionally, for another 5-8 minutes, until onions soft and starting to caramelize. If the bottom of the pan starts to darken too quickly and looks like it may start to burn, add a tiny splash of water and scrape up the brown bits on the bottom of the pan and stir to incorporate the liquid into the mushroom mixture. Once mushrooms and onions are caramelized add grated garlic, thyme, nutritional yeast, paprika, coconut aminos or tamari, black pepper, and salt. Stir and cook for about 30 seconds – until spices are fragrant and sticking to the bottom of the pan. Be careful not to let them burn – if the bottom of the pan darkens too quickly, skip to the next step and pour in the broth immediately. Pour in broth and scrape up any brown bits that have formed on the bottom of the pan. Bring to a simmer and set a timer for 5 minutes. While the mushrooms and broth are simmering, prepare the cashew cream. Drain cashews (making sure that they have soaked for at least 30 minutes), and add to a blender with 1/2 cup of hot water. Blend on high until smooth and creamy, and no pieces of cashews remain. When the 5 minutes is up, pour the cashew cream into the skillet with the mushroom mixture and turn the heat down to low. Stir to combine. Bring back up to a gentle simmer and cook for another 5 minutes or so, stirring frequently to keep if from sticking to the bottom of the pan. If, after 5 minutes, the gravy seems too thin, continue to simmer until it’s thickened to your liking. If it seems to thick after 5 minutes, thin it with a little extra broth. Taste and adjust seasoning one more time before serving. To re-heat: warm gravy slowly in a small sauce pan or skillet, stirring frequently so it doesn’t start sticking to the bottom of the pan. If it seems too thick, thin with a little bit of broth at a time until desired consistency is reached. Taste and adjust seasoning if needed before serving. I servef this over Trader Joes fresh gluten free fettuccini and it was fantastic. Looking forward to making it again. 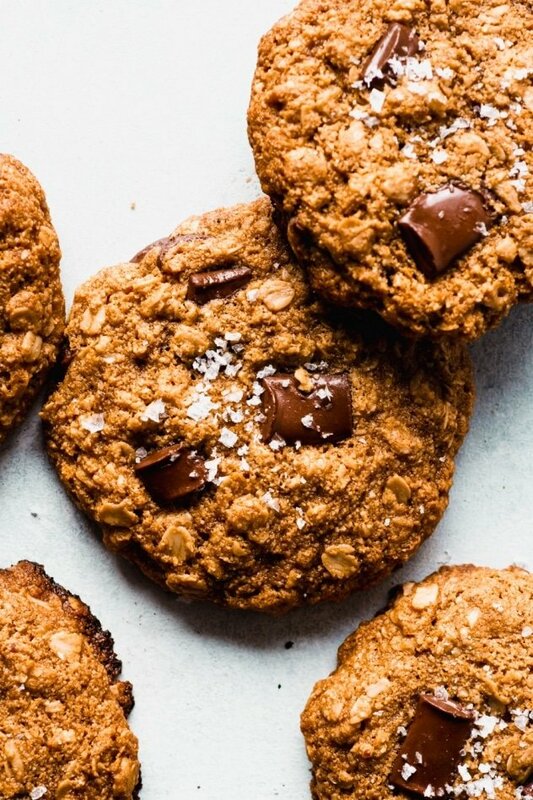 Ohh YUM! That sounds delicious. I didn’t even think of serving it with pasta – I’ll have to try it!